Funny story – I had an awards ceremony for my youngest child this week and I walked out of my closet with this off the shoulder flouncy top and this tight black skirt. My husband takes one look at me and says, “You look hot, but maybe you should change.” Hint taken. Insert striped blouse and chic black shorts instead. Still trendy, but won’t get me dirty looks from the mommies and questionable glances from the daddies in the class. The thing I love about this blouse is that it has stripes as we all love, but it switches between vertical and horizontal stripes and gives it a more updated look. A thin, flowy shirt like this needs to be paired with something a little tighter on the bottom, like these fitted shorts or skinny jeans. I usually have a hard time finding shorts that fit my petite frame but these are perfect in every way. These shorts are a high rise style and made with a stretch material (that is super sleek and soft) that makes it easy to pull on and off. 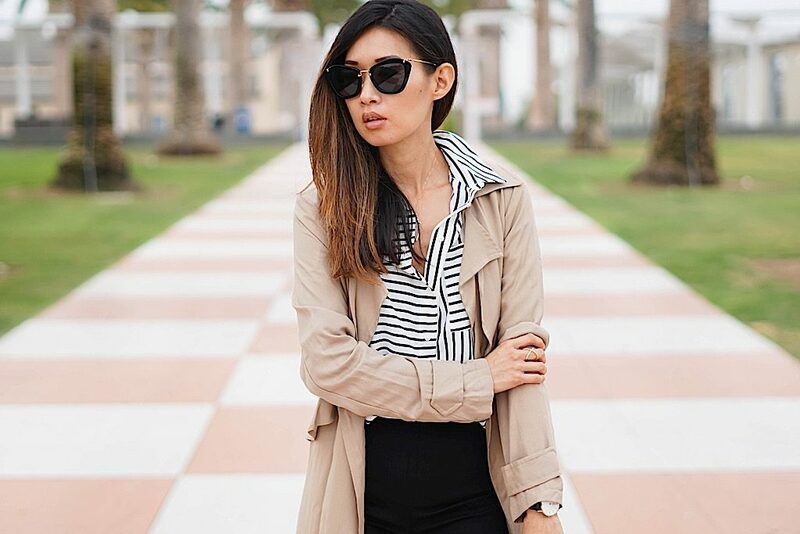 A classic look like this needs an equally classic trench that is lightweight and drapey to layer over this ensemble. Love your over-all outfit. But i love the striped top the best! Thank you! I think you always need a good blouse to wear with jeans, shorts and even skirts. This one is light and fun, isn’t it? Those shades are stunning! Beautiful look! Thank you Carina. They’re by Mui Mui but I get them through Ditto. Use my code of DAILYKONGFIDENCE to get a free month of designer sunnies for free! Super chic look! I love the striped blouse! Thank you so much. I don’t usually wear too much stripe, or color for that matter, but I like this blouse and it totally fits into my monochrome closet doesn’t it? You are still hot! He needs to hid you and throw away the key! Hi Pauline! You are too sweet as always, but you know he was right for once. The first outfit would’ve definitely gotten me stares, and not good ones that’s for sure! Stripes is about as colorful as I get hehe. These wedges are so comfy and so much more affordable than the Chloe version. I couldn’t resist adding them to my shoe closet even though I usually opt for heels. I am so obsessed with stripes right now and I love that you paired our arrowhead necklace with this chic outfit! Done right…every time! Woooow, what a stunning look! Love everything!